Afford Your Home The Breath Of Fresh Air It Deserves & Get Rid Of All Odors - Starting Today!Do you like to keep your home clean and tidy, but can't find a way to get rid of the odors in your refrigerator, bathroom, or other closed space? Don't you hate it when you open your closet door to get something, just to be overwhelmed by the musty smell of mildew and mold? Well, we got your back! This simple yet smart product by Freegrace may just prove to be exactly what you need! 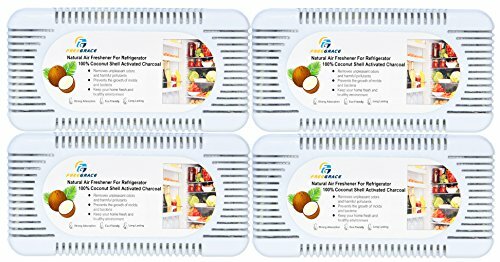 Premium Activated Carbon Air Purifying Bag Pack - 4 Coconut Shell Charcoal Odor Absorbent BagsOur coconut shell charcoal's small particle composition and unique pore uniformity grant it uniquely potent absorption and dehumidification properties. In fact, it is 3 times stronger than bamboo activated charcoal! What's more, these amazing activated carbon deodorant bags are really easy to use; all you have to do is place them in your fridge, closet, shoe cabinet, bathroom, or any other enclosed space. The charcoal will absorb all musty and unpleasant odors like a sponge, and voila! Fresh air! These air purifying bags also help prevent the growth of mold, mildew, bacteria, fungi, and other harmful microorganisms! A Odor Absorbing & Air Purifying Product - One You Can Use Again & Again! Not only is coconut shell activated carbon charcoal up to 3 times more efficient than the more common bamboo charcoal, it's also reusable! All you have to do is place them bags in the sun for 60 minutes each month, and their air purifying effects will last for up to 2 years! So, What Are You Waiting For? Get Your Own Premium Activated Carbon Air Purifying Bag Pack Today! Just Click 'Add To Cart'! ✔ THE ONLY COCONUT SHELL ACTIVATED CARBON ON AMAZON: You can go on and forget everything you knew about air fresheners so far. Coconut-shell activated carbon is all natural, FRAGRANCE-FREE, and absorbs moisture, allergens and unpleasant odors like a sponge. In fact, it's up to 3 times more potent than similar bamboo charcoal deodorant products! ✔ UNPARALLELED AIR PURIFICATION ACTION: With a high 1832 degree activation temperature and unique pore uniformity, our small particle coconut shell activated carbon has supreme absorption properties. What's more, each bag is independently sealed and packaged to guarantee maximum effectiveness! ✔ INCOMPARABLE 4-PIECE VALUE COMBO: Save both time and money and grab this great value coconut shell activated carbon bag bundle. With no less than 4 air purifying bags included, it definitely meets all your odor absorber and air purifier demands! ✔ GREAT FOR RENOVATED HOUSES & NEW CARS: Due to its very strong absorption properties, coconut shell activated carbon has been scientifically proven to reduce the amount of formaldehyde, ammonia, benzene, and chloroform gases emitted from everyday items such as paint, carpeting, furniture, air fresheners, chemical cleaners, rubber, and plastics. ✔ 100% RISK FREE PURCHASE: As with all Freegrace products, this activated carbon air purifying bag bundle is covered by a 90-day money back guarantee. If for some reason you're unhappy with your coconut shell charcoal odor absorbent bags, don't hesitate- just contact us! After all, there's nothing more important to us than your satisfaction! If you have any questions about this product by Freegrace, contact us by completing and submitting the form below. If you are looking for a specif part number, please include it with your message.